They are of him the same family and of the same genus as the Walnut. Origin : East Coast of North America. It is found in the natural state until Ontario in Canada. It is even cultivated in the Southwest of the Quebec. 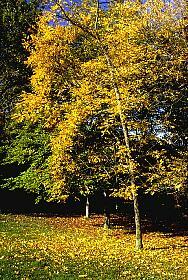 Habitat : the black walnut is most comfortable in neutral and well drained soils which are generally humid and fertile. In zones with heavy soil, it does well in the high ground and on slopes above the floodplain. Black walnut does not tolerate shade. Growth quick, quicker than the European walnut. Big leaves opposite, composed of 11-22 leaflets (the final leaflet is often missing) # Common walnut: alternate, 5 - 11 leaflets. The leaf and roots are impregnated of juglon, as the European walnut.The leaves turn to a lovely golden color in autumn, but they often fall early in autumn. The leaves which litter the soil are of a nice effect. Uses: the wood of the Black Walnut of America is used in cabinetmaking. The nut is edible. It has a taste very soft and comparable to that of the Walnut of Europe (the nuts of Grenoble) but it is slightly smaller. In the United States and in Ontario, many people cultivate these trees for their nuts because there are recipes and ways to prepare them. Habitat: it supports the mild climate of the South of France. Use: the nut of pecan is edible. Origin: North America and China, introduced to France at the end of the XVIIIth century. Size: 30 m tall. Distinctives: slim grey bark; leaves composed in 3 - 17 leaflets.